Seeing them perform in various venues (and countries) over the years, it’s still easy to get caught up in how much of a good time their live sets are. ‘Little Lion Man’, ‘Babel’ and ‘Lover of the Light’ make an early appearance in the set, which stands to push the crowd to the point of ecstasy within about fifteen minutes. Yet despite the size of the venue (and sold-out crowd), the show feels surprisingly intimate; the emotional and physical symbolism of the songs resonating for different reasons in different fans. ‘Guiding Light’ adds a great depth to the bands stunning repertoire of melodies – amplified further by the eye-gasm of the lighting rig that punctuates their set so flawlessly, that the whole night seemingly feeds all your senses. ‘Tompkins Square Park’, ‘Ghosts That We Knew’, ‘Believe’ and ‘The Wolf’ compliment the bands diversity of sound since their folk-rock beginnings; but always managing to be uniquely recognisable as their own. 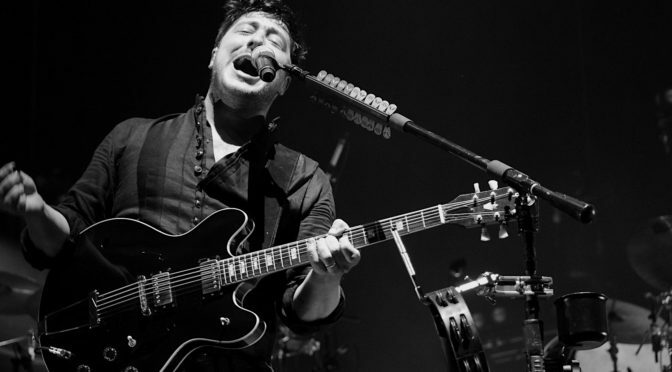 Even the live sets are unique to their performance, with each member playing variations of instruments throughout the show – at some points, Mumford switches instruments two or three times without breaking a sweat. “We have four albums now, so we’re almost a real band,” Mumford jokes. 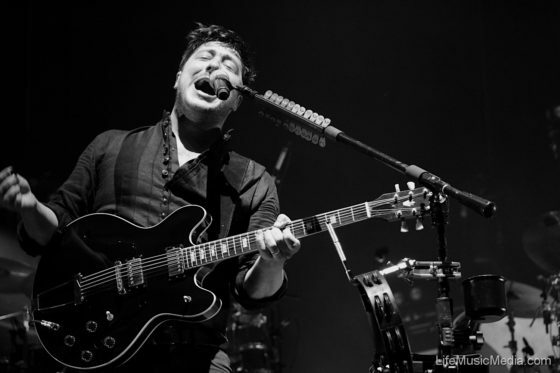 But all jokes aside, there is a little doubt that Mumford & Sons are one of the most formidable and entertaining live acts around; a mesmerising, engaging and charming band that will continue to be a crowd favourite for many years to come.